James McClean speaks to the media at the Republic of Ireland Press Briefing in New Jersey. JAMES MCCLEAN HAD something on his mind. Maybe it had been brewing on the seven-hour charter flight across the Atlantic, as he looked around at the others decked out in Ireland team tracksuits. More likely it had been on his mind for some time. Either way, he chose Tuesday morning’s return to the New Jersey soil that has been improbably kind to him to get it off his mind. In a panel made up almost entirely of players drawn from the Championship, McClean is one of just two Premier League representatives marked present Stateside this week. This time at least, that is by design as Martin O’Neill uses Thursday’s friendly meeting with Mexico at the MetLife Stadium as a chance to experiment but largely keep his front-liners held back for the hugely significant clash with Austria next week. A deep thinker, McClean’s thoughts though were on the other occasions when those summoned for national team duty make their excuses. And he didn’t mince his words. “It gets on my nerves when players come in and they’re not fit for games but they are for the club games at the weekend. That gets to me,” said McClean after training at the New York Red Bulls’ training facility in suburban New Jersey. When asked about being front and centre here, the West Bromwich Albion winger had initially joked that “my wife got bored of me so she wanted to get rid of me” this week but his true feelings weren’t backward in flowing forward. Joking aside, I want to play for my country and I want to get as many caps as possible, if I am fit and feeling good then I want to play, no matter what time it is, I want to play. Without singling too many players out, there have been players in the past who pulled out of games with injuries but always seem to be fit for their club side on the Saturday,” added McClean. “It annoys me very much. Either you are proud to represent your country, that should be a great honour, go and play, be delighted to pull on the jersey. If you don’t want to be here, don’t be there. Don’t come in and then leave because you are taking a chance [away] from someone else to come in in the first place, that definitely annoys me. It’s an understatement to say that hasn’t been McClean’s style. Over the past three years he has featured in 27 of Ireland’s last 28 senior internationals. More than that, the maturing 28-year-old has become an ever more central figure in O’Neill’s Ireland. After an at times frustrating club season, he will again find comfort in green when he almost certainly captains his country for the first time on Thursday. He will do so at the modern incarnation of Giants Stadium, winning his 50th cap at the site of his first goal. That New Jersey provides significant staging posts in his career is of a piece with McClean’s journey less ordinary. If you had told me that the MetLife Stadium would end up being an important place in terms of my career I’d probably have laughed at you but that’s just the way it’s gone,” said the winger, Ireland’s top scorer on the road to Russia with three goals in five games. “It’s been a good year. Obviously getting picked for that [European Championship] game against Italy; given the magnitude of the game as well. That really gave me a lot of confidence, particularly with the way that the game went as well. I’ve pushed on from then. Email “James McClean annoyed by unfit Ireland players who are available 'for the club games at the weekend'”. 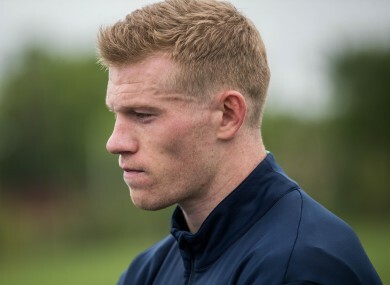 Feedback on “James McClean annoyed by unfit Ireland players who are available 'for the club games at the weekend'”.